If you want to mine GPU Coin with Nvidia GPUs you will need to use the cudaminer software miner. GPUC uses Scrypt-Adaptive-Nfactor and not the standard Scrypt algorithm, so you need to run cudaminer with the –algo=scrypt:2048 parameter and not just with –algo=scrypt. Do have in mind that you should see about half of the typical Scrypt hashrate you get when you start mining for GPU Coin and that is absolutely normal due to the different algorithm being used. 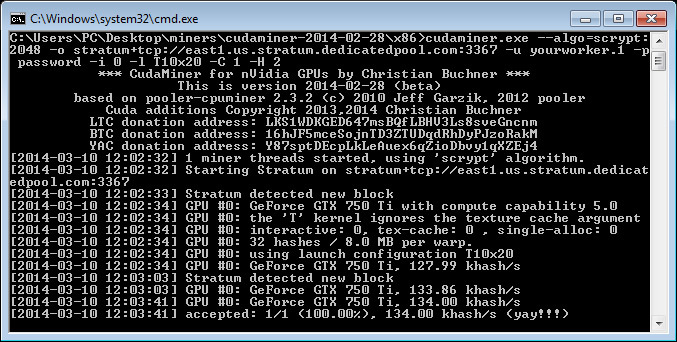 Below you can download the latest version of cudaminer 2014-02-28 for Windows with BAT files ready with the settings for mining GPU Coin, so you just need to configure them with your pool settings and start mining. Note that the default settings are the best for mining with GTX 750 Ti graphics cards, so you might need to change the kernel to another one based on your GPU or just remove the line setting up the kernel to use the autotune feature. 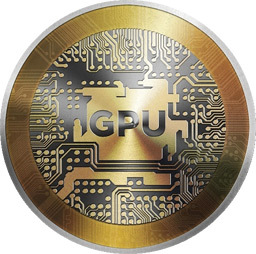 GPU Coin (GPUC) is a new Scrypt-Adaptive-Nfactor cryptocoin that just recently launched. The idea of the authors of this crypto is that they will have an on-line store that specializes in keeping a large stock of GPUs that will only be available to be purchased with GPU Coin, something that might work well if you are in USA. This is probably where the name of the coin also came from. Note that currently the block reward is set to 1 and the full rewards start at block 2600! You need to use VertMiner for mining GPU Coin and not the standard cgminer, because of the algorithm used by the coin.